Madison Eyes (Madison) - Book Appointment Online! Madison Eyes is a family-centered practice that treats patients of all ages, from infants to the elderly. The goal is to meet the complete eye care needs of individuals and families with an emphasis on eye health, vision, comfort and style. Services offered include wellness and medical eye exams for children and adults ages six months and up, availability of high quality eyeglasses, and all types of contact lenses. Three licensed opticians are on staff providing individualized attention and style consultation. 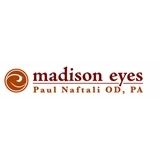 In addition, Madison Eyes offers treatment for urgent medical eye problems 24 hours a day, 7 days a week, as well as pre-operative and post-operative care for laser vision correction. I have recommended Paul Naftali, OD to three other people now & they all had very good experiences. One person did have some problems with framing their new glasses, but it was due to a genuine accident and Madison Eyes did everything they could to remedy the situation as quickly as possible. Everyone in this office were super professional and I didn’t have to wait at all for doc or add’l tests. Everyone was so helpful. Nice vibe too, you can tell they are a thriving business.